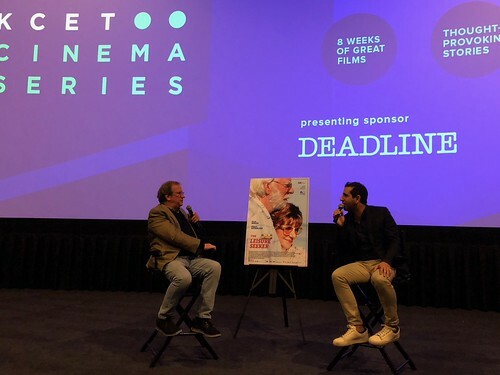 Cinema Series host Pete Hammond with Producer Dov Mamann after a screening of "The Leisure Seeker"
Following a screening of “The Leisure Seeker,” producer Dov Mamann attended a Q&A hosted by Cinema Series host Pete Hammond. The Leisure Seeker stars Academy Award®-winner Helen Mirren and two-time Golden Globe®-winner Donald Sutherland as a runaway couple on an unforgettable journey in the faithful old RV they call “The Leisure Seeker.” The couple travels from Boston to Ernest Hemingway’s home in Key West, recapturing their passion for life and their love for each other on a road trip that provides revelation and surprise right up to the very end. Producer Dov Mamann is a branded content producer born and raised in Los Angeles. He is currently head of U.S. Production for the Italy-based production company Indiana Production producing English and Italian language productions for the global market. In addition to The Leisure Seeker, Mamann has produced two of Paolo Virzi's other features, Human Capital and La Prima Cosa Bella, both of which were selected as Italy's official Oscar® entries for foreign film. On the brand advertising side, Mamann produces campaigns for Audi, Volkswagen, Maserati, Zegna, Armani, Fiat, and many others. He has been working in the entertainment industry for 15 years and has worked in the development department at DreamWorks, the production staff of "How I Met Your Mother" and the motion picture literary department at Creative Artists Agency. In 2010, he began as the development executive to director Gabriele Muccino, helping to push forward the development and production of several projects including films, commercials and music videos. Listen to the Q&A and browse photos from all 2018 Spring KCET Cinema Series screenings below.